So, I wouldn’t say that starting my reading challenge with Winter’s Tale was a failure. I would say that it has presented challenges so far. It’s heavy, which means I’m not carrying it around in my bag unless I expect to have some reading time during the day, and I’m just finding it hard to get into. Friday night, with no plans but an after-work gym session, a homemade meal, and an evening of reading, I decided to take a little detour. 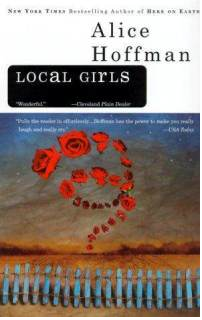 Rather than continuing to plod through Helprin’s book, I took a break and started Alice Hoffman’s Local Girls, which my friend Lyz recently gave me. I promptly read 120 pages in one sitting, and devoured the rest on Sunday night. It was beautiful and absorbing and so true. And it delivered the breather I was searching for. Do you ever read multiple books simultaneously?